Kyolic® originated from time-tested organic farming techniques free from pesticides, herbicides and chemical fertilizers. Organic cultivation is essential to grow pure and natural garlic bulbs which are well balanced in nutrients. Harvested at full maturity, the garlic cloves are naturally aged to convert harsh and odoriferous compounds such as allicin, into mild, odorless and stable water-soluble sulfur containing compounds which offer the benefits of garlic. Kyolic is quality assured from soil to shelf. The whole production process of Kyolic is controlled by over 250 stringent quality checks to ensure its safety and efficacy, conforming to international GMP (Good Manufacturing Practice) guidelines. Additionally, Wakunaga has earned the distinctive ISO 9001:2008 certification, recognizing compliance to the international quality standard and demonstrating the company’s commitment to total quality assurance. 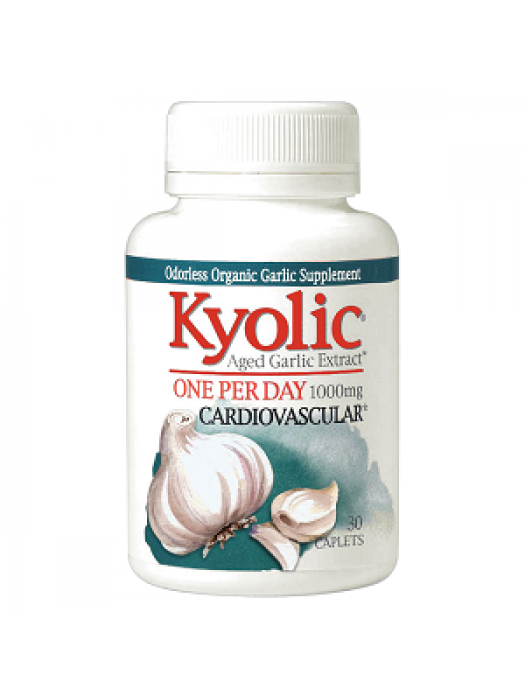 Wakunaga Kyolic® One Per Day contains Aged Garlic Extract™ of 1,000 mg per caplet. KYOLIC® Aged Garlic Extract™ begins with 100% organically grown garlic bulbs. They are then aged to perfection in a unique extraction process to eliminate odor and create beneficial compounds found only in Kyolic®. Kyolic® One Per Day helps maintain healthy circulation, normal cholesterol, homocysteine levels and overall cardiovascular health in one convenient caplet.